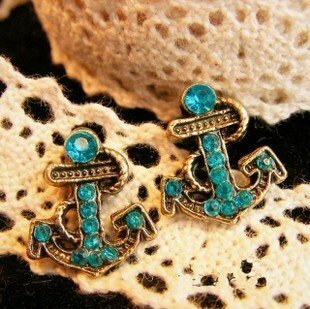 Bronze Crystal Anchor Earrings Only $3.29 SHIPPED! You are here: Home / Great Deals / Amazon Deals / Bronze Crystal Anchor Earrings Only $3.29 SHIPPED! Nautical-themed items have been popular lately, and I have a great item to add to your jewelry collection – get these gorgeous Bronze Crystal Anchor Earrings for just $3.29 + FREE shipping! I LOVE these! If I wore earrings, I’d totally grab them!